A buttery full cream Jersey milk Gouda showcased in a neutral wax. It has a warm golden colour with a delightful savoury flavour, and a smooth supple texture for slicing. Our Spiced Gouda has a silky texture with a delicate spread of caraway seed, which provides strong aroma and flavour. Presented in a showy red waxed ball. This cheese has a beautiful silky texture and convey the characteristic round shiny eyes. 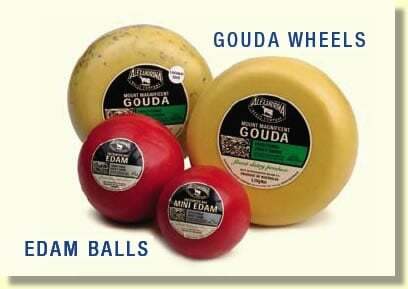 Our Edam provides a nutty sweet flavour to the palate. It has a delicate and creamy mouth-feel; with a firm, clean cutting texture. Awarded 2006 Gold Medal - CheeseFest 06.